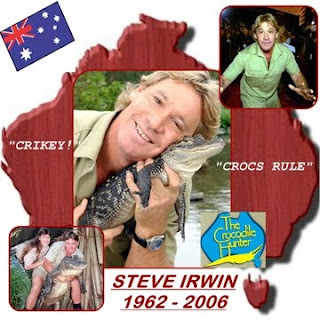 I have spoken to many friends here in Asia about the late (and great) Steve Irwin – otherwise know as the ‘Crocodile Hunter’. It seems to be a common misconception (probably brought on by his sensationalist TV shows and movies) that he was very haphazard and was prone to disaster. It should be noted however, that his ‘cocky’ attitude associated with his activities should not be construed as flirting with danger. 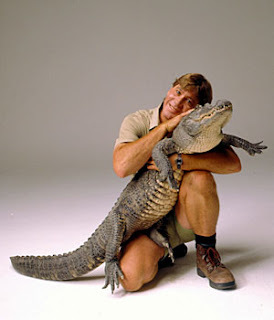 What is not commonly shown or discussed on TV here (that I have seen), is the fact that his work with saving endangered species along with his passion for protecting the environment, was brought about by a lifetime of working (first - when he was just a child - with his father) with some of the world’s deadliest creatures. He was the ultimate experienced professional and knew the anatomy and behaviour of all the animals and reptiles that he handled. He knew his limitations and held a strong respect for the awesome power and sheer beauty of the wildlife he encountered. It is very little known that throughout his entire career, he was never once envenomated by a poisonous snake… and he handled (and rescued) thousands of them. It is also important to note that his very untimely death was brought about by a ‘freak’ occurrence. “Death by Stingray” is extremely rare – a variety of sources offer different figures when it comes to total recorded deaths from stingrays, from “fewer than 20” to “about 30”. It is actually so rare that there is no international monitoring effort on this subject. According to a reliable source, “The animal's barbed tail delivers venom that causes excruciating pain, but it almost never kills”. Suffice to say, Steve Irwin was not taking a mortal risk when he died from a stingray barb in his chest – it was a very rare and freaky accident. Having said that, I am quite positive that Steve Irwin would not have considered entering an enclosure with a lion and hitting it on the face and head (all the time describing such actions as “playing”). Moreover, why would untrained British journalist, Charles Starmer Smith subject himself to such a risk? Why would he enter the cage with one-year-old “Mapimpan” (little baby) in the first instance? Why was he even allowed to do so? Even the lion’s trainer could not calm the beast down. First, Mapimpan locked his jaws around one of Starmer Smith’s legs before targeting his head. When the reporter threw his arms up to protect his face, the lion decided to chew on his shoulder instead. According to Starmer Smith, he was warned of the risks before he entered the cage. He went on to say, “It rose on to its haunches, towering above me and I was spun into a waltz with a 300lb (136kg) predator - as I pushed desperately at its throat to keep away its jaws… This did not feel like playing”. After this first incident, Einstein Smith remained in the cage “…(It) was on me again, its teeth bared as it lunged towards my neck. I raised my forearm to divert its jaws from my face, then felt razor-sharp teeth ripping into my shoulder. The next few seconds were a blur of claws, teeth and shouts as I stumbled around, helpless against the power of this animal”. In my mind, he was extremely lucky to walk out of that cage just requiring some stitches… I can’t help but feel so sorry for the lion to be held in such a small cage in the first place, let alone be teased and taunted by hits to the face and head (under the guise of “playing”). I have but one question: What were all these people thinking? That guy is lucky he is still alive! Like he had to show us that lions can kill us, somebody make sure and tell him that we already know that!